Convert kitchen scraps into nutrient-dense compost and fertilizer with the extremely popular Can O Worms Composting Bin. Created by the folks at The Worm Farm, this vermicomposter is notable for its appearance on The Martha Steward Show. It’s simple design and straightforward process make it the perfect choice for beginners to worm composting. The ventilated, pest repellent container uses a stacking design to force the worms to eat upwards to new material. This accelerates the creation of worm castings and tea. These organic products can then be used to enrich your garden through composting. 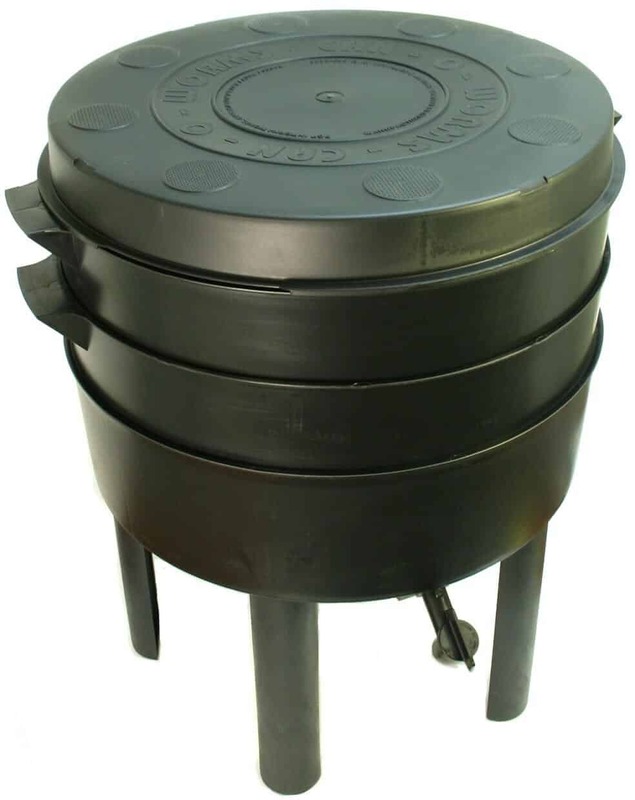 Read our review below to see if this particular kitchen composter is the right choice for you. The Can O Worms Composting Bin measures 20 x 22.5 x 28.5 inches when fully assembled. It weighs roughly 17 pounds when empty. This vermicomposter is the largest worm bin currently offered by the Worm Farm. It’s constructed from 100% recycled plastic and features a durable construction. Multi-level 3-tray construction enables the kitchen composter to hold up to 20,000 worms. Perhaps the most important feature is just how easy it is to learn to use. Even newbies to worm composting will be able to get a hang of the process in an instant. User-friendliness was a chief consideration during the design process. 5 legs and a short and squat design ensure sturdiness. Fully assemble this worm bin and there’s no chance of it tipping over. The construction is likewise rugged, greatly increasing the composting bin’s overall lifespan. It incorporates multiple side vents for air circulation. This helps keep the worms healthy. It also ensures that their castings and juice remain in prime condition for collection. Despite the top-notch ventilation system, this vermicomposter is highly regarded as one of the best at preventing odors. A tight-fitting lid is thanks in large part for this. Molded mounds in each of the 3 trays encourage worms to work upwards. They move to the surface to digest the most recently added waste. The multi-level construction helps move their worm castings and worm tea to the bottom of the bin for easier collection. Collect your valuable worm juice with a screw-in cap. We like the fact that it’s removable as it helps prevent dripping. And less dripping helps prevent pests in turn. The worm juice and worm castings can then be used as an earth-friendly, nutrient-rich fertilizer for your plants and garden. The fertilizer is 100% organic. It directly results in a greater crop yield as well as much tastier plants. The product also comes with a 1 year limited warranty. The warranty protects you from manufacturer’s defects. You can rest assured that you get what you’re paying for when you select this particular vermicomposting bin. Sturdy Construction – Short, squat, and heavy-duty construction ensures stability and durability. Simple Design – User friendly to the max, this kitchen composter’s simple design makes it easy for anyone to learn to use. It’s perfect for beginners and children yet is efficient enough for those with more experience. Odorless – Odor can be a real problem with rotting organic waste. This problem is eliminated with a special lid and vents. 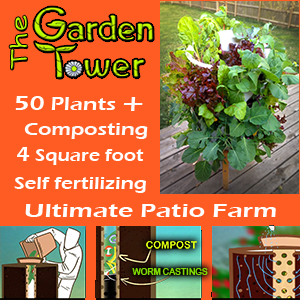 3 Levels – Stacking design helps force worms upward where new organic material is added. The 3 levels also push their worm castings and worm tea downward for easier collection. Affordable – The product costs around $110. An alternate option that comes with 1,000 red worms costs $130. Unattractive – A bit of an eyesore. Unlike some compost bins on the market, this one isn’t very stylish. If you care strongly about your kitchen décor, you might want to store yours outside. Lack of Wheels – This vermicomposter is heavy when it’s empty. It’s even heavier when it’s full of soil, worms, and waste. Moving it to a new location is difficult without emptying it since it doesn’t have wheels. Difficult to Clean – Some users have noted that the side vents become easily clogged with residue. They’ve also noted they’re difficult to clean. Most users with this problem have been able to solve it by using a straightened paperclip or similar long skinny object for cleaning. Is The Can O' Worms Right For Me? Through the vermicomposting technique, it creates rich compost much more quickly than traditional composters. · Straightforward and efficient process. No bells and whistles design makes this vermicomposter easy to use. See all the benefits of composting with worms without much effort. · Unoriginal appearance. Nothing looks special on the outside. The inside, however, is a whole different story with a smattering of useful features. Those interested in composting organic kitchen waste will love the this comost bin. It’s a simple, efficient, barebones composter to learn about vermicomposting. We recommend this product our of our Compost Bin picks for its affordable price, overall durability, fast composting time, and user friendliness. Check Out Can O' Worms NOW!